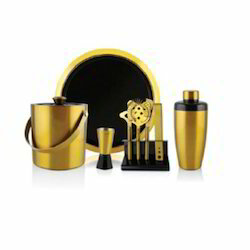 Especially designed for those who would like to feel the Royal Touch while having drink or two. This bar set is perfect to boost your Bar-Tending Skills and Add Luxury to it, without being too loud. Impress one and all with exquisitely designed product that stands out from rest, as this bar set is enough to add Sparkle to your Party Night. Beverage Range offered are highly suitable for providing a refreshing usage feel and come elegantly packed so as to offer an attractive gift value during different memorable occasions. We can offer these beverages in choice of different design flavours to choose from. We are one of the topmost names occupied in offering of a broad collection of Stainless Steel Bar Tools Set that is beautifully crafted and attractively designed using matchless quality raw materials. Making the cocktail parties cheerful and memorable, our splendid collection of bar accessories is widely used in professional as well as individual bars. We offer an extensive range of bar tool set curve which is uniquely designed to cater to the needs of bars, restaurant & hotels. These bar tool set curve are available in different styles and size. Accurately mark out, cut and made out of mild stainless steel, our range of cork opener are acknowledged for their finishing and pretentious designs. 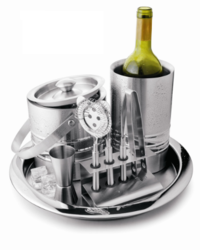 We are betrothed in presenting an extensive range of SS Bar Accessories. This product is manufactured using the advanced techniques and optimum quality material which is bought from reliable sellers of market. Owing to high demand, professionals make these products in diverse sizes and designs that meet on customers demand. Dei Gratia Impex Pvt. Ltd. Brand: Brand Label can be customized as per our valued buyers. Backed by massive industry competence and experience, we have come up with a fine quality SS Peg Measure. This Bar-Wares range of products are made utilizing supreme quality raw material and their combination on the bar table is an asset to any bar. We offer a wide range of stainless steel bar tool sets, which are easy to use and clean. These are made of qualitative stainless steel, which ensures durability and are highly corrosion resistant. In addition to this, our products are used in preparing, serving and especially eating food.